What a lot of work on Wednesday to get all the last minute moving tasks finished at the house. 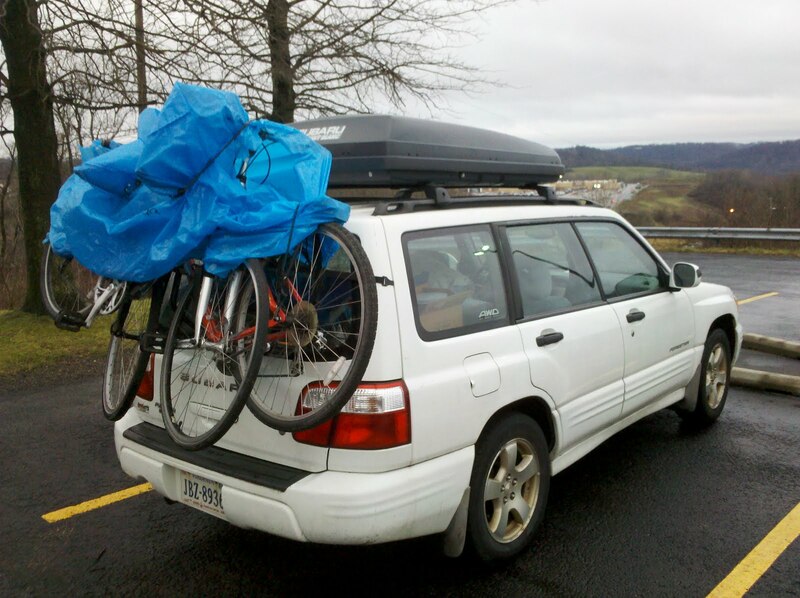 Not to mention, the work of getting the car loaded with everything we need to begin our travels. We didn’t leave Oakton as early as we had hoped. It was almost midnight before we got to Kelly’s house in Morgantown, West Virginia. I know Lee must have been exhausted from the days of preparation for the move, but he just kept on driving. I could barely keep my eyes open and dozed on and off most of the way there. But we arrived safely and, although, it could be buried deeply in the bottom of a container, who knows where, in the car or in the carrier on top of the car we were fairly certain we had managed to remember all the essentials. And we felt that the house had been left in a good condition for the landlord to come in and prepare it for the next tenants. All of our 13 1/2 years of marriage have been spent in that house in Oakton and we will carry many fond memories of our time there. As you can see, we don’t look too much like vagabonds as we travel the country in our heavily loaded car. 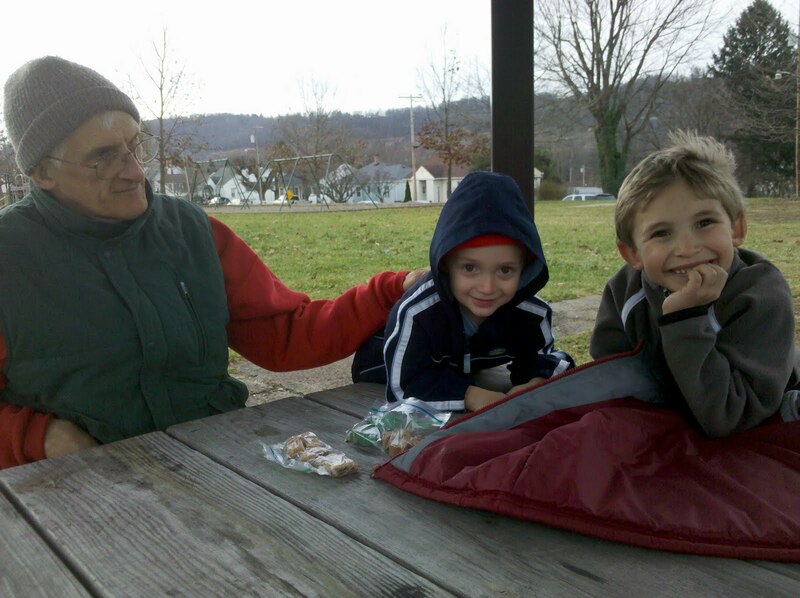 Yesterday, we enjoyed spending time in Morgantown with our 2 grandsons. The weather has been unseasonably warm, and, although there were a few sprinkles of rain, we were able to walk with the kids to a nearby park. 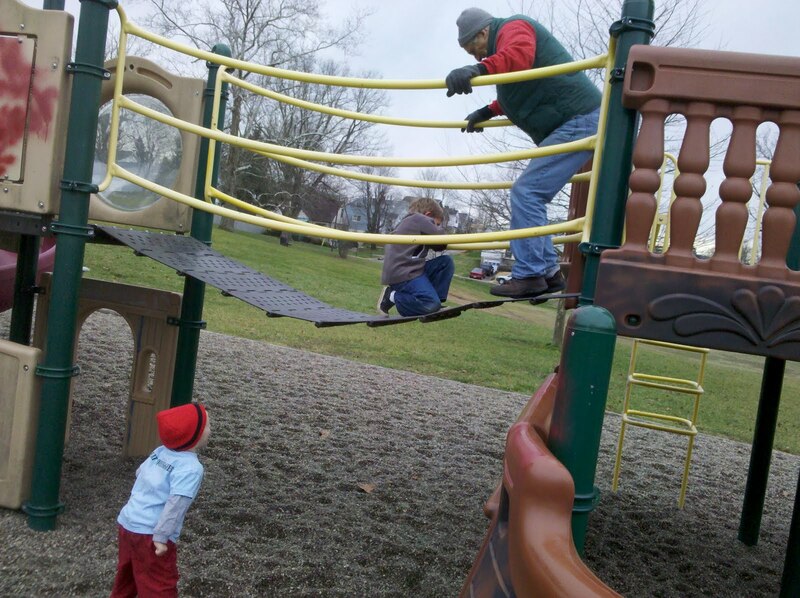 Grandpa played “pirates” chasing the boys around the playground while Grandma dozed on a park bench. (Grandma sure does like to doze, doesn’t she? And wait till we get to Florida where I will be able to doze on a bench somewhere in the sun). Today we will get back on the road and drive up to Ohio, spending the night in Bowling Green with Lee’s brother. There were times when I didn’t think it would happen but it looks like we will make it to Iowa for Christmas!